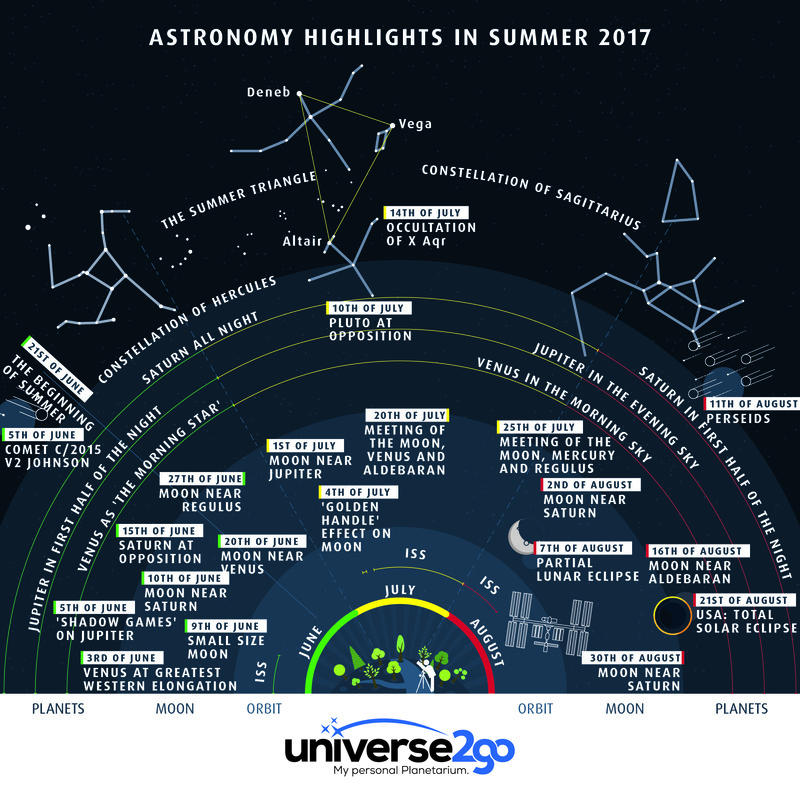 The astronomical calendar for the next three months: our newest infographic “Astronomy Highlights in Summer Summer 2017” shows you everything at a glance that you can expect to see in the night sky from June to August. For those early birds, as special treat: Venus. The second brightest object in the night sky, after the Moon, will reach its greatest western elongation from the Sun at 46°. With a telescope, you should even be able to recognize it as a partially illuminated disk. Jupiter stood in opposition to the Sun in April. Yet, even now, the planet is easy to see and will reach 40″ disk diameter. From early evening, there will be quite the shadow game on Jupiter, as its two large moons Europa and Io transcend the gas giant. No matter what, it will be a fantastic opportunity for photos. This comet has recently become a real highlight among amateur astronomers. C/2015 V2 Johnson was discovered 3 November 2015 and can be found at the moment in the constellation Boötes close to the star Arcturus. With a magnitude of just under 7 mag and a circumpolar position, it is quite a showcase, remaining visible the entire night. Pull out your telescope and look for the comet. It’s well worth it! An especially small Moon will be visible tonight. Our satellite will have a distance of 405,000 km from Earth. If you want to remember the difference in the Moon’s size, right now is the time to capture an image! Quite a sight tonight between the Moon and Saturn. During the evening, turn yourself to the southeast as the Moon rises. Just above it, to the right, the shining, yellow Saturn. The two will appear approximately 9° apart. On the 15th of June, Saturn, the lord of a thousand rings, will stand in opposition to the Sun. Visible the entire night throughout June, our second largest planet will rise just as dusk approaches. The planet’s rings will be open at a maximum of 26°, allowing us to see considerable detail. Unfortunately, the planet’s position will also be pretty low, resulting in a possible disturbance to observation. Nevertheless, Saturn is a fascinating object! This morning will be especially nice, as long as the weather plays along! At dawn, you will be able to look to East to see a pencil-thin crescent Moon at only 4° above the morning star. Something always enjoyable – a small but waxing crescent Moon just above the horizon. Even more beautiful still is when the Moon makes a stop at a bright star. Today the Moon pays a visit to the feet of the constellation Leo and Regulus. Tonight, the Moon will slowly push past Jupiter, pay a distant visit at 5°. While we enjoy the Summer evening, a sporadic glance to the southwest is well worth it! The Golden Handle on the Moon… sounds like a myth, yet is something you can really discover – a ring of light, which appears just barely on an unilluminated area of the Moon’s surface. It always appears, when the waxing Moon is illuminated at 83%. At the Mare Imbrium, the bay Sinus Iridum plays a part. This bay is surrounded by the chain of mountains from the Jura range. While the valley remains in darkness, the Sun shines on the mountain peaks and the Golden Handle shows itself on the Moon. Eleven years ago, our friend Pluto was still a planet. Then it received the biggest demotion yet. Now Pluto is considered a dwarf planet and the mnemonic device to remember the solar system is now: “My very enthusiastic mother just served us noodles”. Nevertheless, Pluto is quite a nice planet to observe, when not difficult to find. A star map and a big telescope are a must to observe the 14.2 mag planet. The Moon does not stand still in the sky, of course, so the occasional occultation occurs (say that five times fast). The star disappears from one second to another, even though you already see it coming, it is always a surprising phenomenon. On the 14th of July, the Moon will pass through Aquarius and occult X Aqr at around 1:43 AM CET. Of greatest interest will certainly be seeing the star reappear on the unilluminated side of the Moon at 2:56 AM CET. A constellation of many celestial objects is quite a sight for observers. On the 20th of July, it will be worth it to play the early bird and get out of bed a 4 or 5 AM, to have a look to the East. Over the horizon, the waxing Moon along with Venus and the star Aldebaran will form a beautiful triangle. Yet another great lunar sight, best suited for those with a great view of the horizon, as a young crescent Moon meets with the star Regulus at 9 PM CET, while the planet Mercury sits only one degree away. In June, Saturn stood at opposition to the Sun. Now it is easy to find in the evening sky. The Moon joins Saturn on the second of the month. The only partial lunar eclipse will reach only a coverage of 25%. In addition, it will only be visible in central Europe during its last phase. The Moon will push into the shadow of the Earth at around 7:23 PM CET. Only at around 8:45 CET, will the Moon appear in central Europe, as dusk has not yet really set in, really allowing Europeans to only experience the exit of the Moon from the Earth’s shadow. Every year, we are happy to witness the most beautiful meteor show of the year in the Perseids. In the morning hours of the 11th of August, the meteor show will reach its maximum. Around 100 falling stars will appear per hour, coming down with an unbelievable speed of 216,000 km/h. The Moon, sitting high in the sky during the whole night, may cause a bit of a disturbance. We have Comet 109P/Swift-Tuttle to thank for the meteor shower, as we move through its orbit around the sun, in which it left parts of itself. So every year, as the Earth crosses this orbit in August, where the comet crosses, the Perseids shoot through our night sky. Around 2 AM CET, the Moon will rise over the horizon. Just above it, you will see the main star of the constellation Taurus – Aldebaran. The Great American Eclipse! Saddle up cowboys, because on the 21st of August, the USA will experience a solar eclipse with the zone of totality spanning 115 km wide from the Pacific coast through the USA, all the way to the Atlantic Ocean. Totality will last 2 minutes and 40 seconds. The Moon and Saturn will stand in the southern night sky at only 3° apart.